Achieving a sense of timeless trend that will suit both your indoor AND outdoor spaces, the Aggie collection by Home Decorators is everything you've been searching for and so much more! Embodying a series of current trends, these 100% polypropylene pieces will radiate a sense of upbeat and exquisite charm that will surely transform any room within your indoor or outdoor decor. 7 ft. 3 in. X 7 ft. 3 in. This modern Safavieh Courtyard area rug will instantly improve any room you place it in. Make your hallway, dining room, or living room more stylish with this indoor/outdoor plush synthetic rug. This product is machine-made, which assures quality. The geometric pattern on this black rug is very modern and stylish. Add this Safavieh Courtyard area rug to your hallway, dining room, or living room for an infusion of style. Constructed to be an indoor/outdoor piece, this plush synthetic material rug is sure to make a statement in your home. High-quality and high fashion, this machine-made rug is perfect for you. Quality and style come first with this geometric patterned black rug. The contemporary look of this Safavieh Courtyard area rug adds style to any room. Designed to decorate an indoor/outdoor space, this plush synthetic material rug is high quality. This rug is machine-made, which ensures a strong product. Quality comes first in this geometric patterned black rug. This Safavieh Courtyard area rug adds a touch of modern flair to the design of any area in your home. Great quality is assured with this indoor/outdoor piece made out of plush synthetic material. Its machine-made construction is sure to endure the constant treading of feet and furniture. 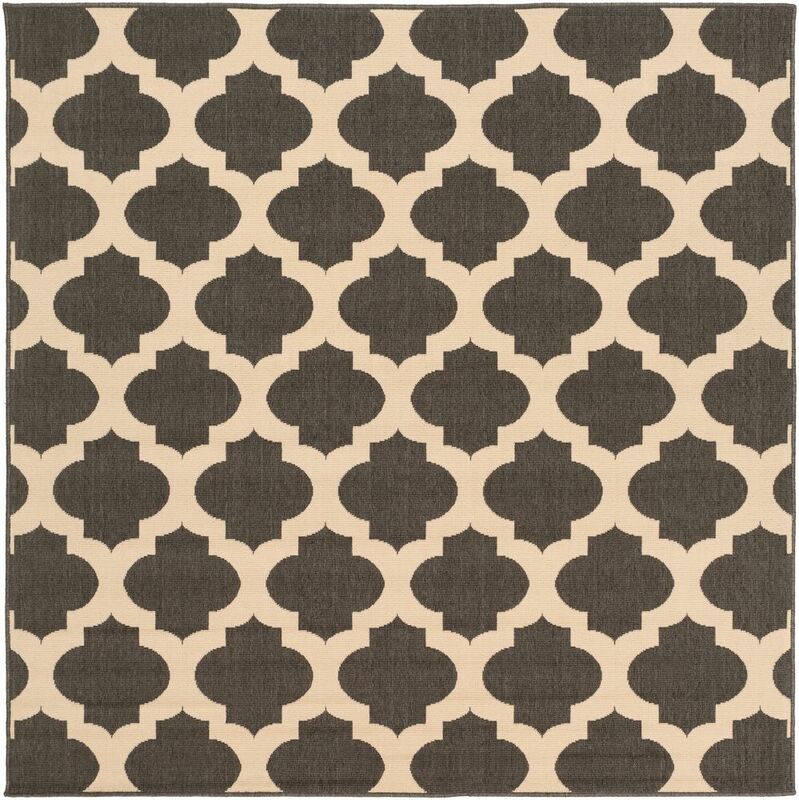 This beige tan rug has a stylish geometric pattern for your modern dicor needs. Aggie Black 7 Feet 3 Inch x 7 Feet 3 Inch Square Indoor/Outdoor Area Rug Achieving a sense of timeless trend that will suit both your indoor AND outdoor spaces, the Aggie collection by Home Decorators is everything you've been searching for and so much more! Embodying a series of current trends, these 100% polypropylene pieces will radiate a sense of upbeat and exquisite charm that will surely transform any room within your indoor or outdoor decor.